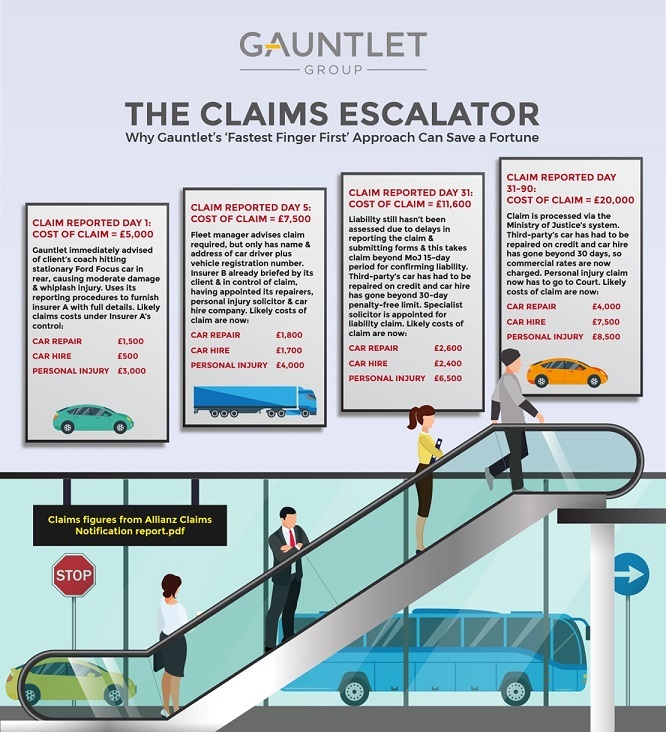 Fleet managers in the commercial transport sector are being warned to avoid stepping on to what leading specialist insurance provider to this sector, Gauntlet, is calling the ‘Claims Escalator’, by insuring their fleet through a broker geared up for a ‘fastest finger first’ approach to claims reporting. Commercial transport insurance specialist, Gauntlet – a game changer in the sector since 1994 – has created systems that allow passenger fleet operators to get in touch around-the-clock, every day of the year, and utilise a tailor-built procedure that gathers all of the key information required to submit a claim as fast as possible. The reason for this focus on speedy claims reporting is control. This is not about Gauntlet being a control-freak, but about an unswerving commitment to keeping its clients’ premiums as low as possible. Quite simply, the faster and more complete the reporting of the claim, in exactly the format, language and detail the insurer needs to proceed with it, the lower the impact on transport operators’ bottom-line. This is not just a nice-to, or a procedure that slightly reduces the final cost of the claim. In fact, the repercussions of not having this sort of approach can be huge. It is likely that many operators are totally unaware of this, which is why it pays to read on. Gauntlet says an accident involving an injury such as whiplash, caused by a bus or coach operator, plus moderate car damage to the third-party victim’s vehicle – a Ford Focus that was stationary when hit – can become a scenario within which the total cost of the claim escalates dramatically. Based on figures supplied by insurer Allianz, this claim could quadruple, solely on the basis of how fast and how well the accident is reported. A pay out for car repair, use of a hire vehicle as interim transport, and a personal injury award, tallying around just £5000 if the incident was immediately reported to the at-fault driver’s insurer on day one, could become a £20,000 claim by day 30. This could be through both slow notification of the claim and the submission of incomplete information when it is finally reported. Here’s an illustration of what happens. If the at-fault commercial transport driver’s insurer, who we will call Insurer A, is brought up-to-speed quickly by Gauntlet, they can make an offer to the third party that involves that party using Insurer A’s own approved vehicle repair network, the costs of which it controls. The vehicle to be repaired can be picked up within a day, for immediate repair. Similarly, the third party can use Insurer A’s preferred supplier for car hire and be referred to a physio whose costs are also under Insurer A’s control. In total, the cost of this claim is likely to be around £5000. Leaving things just four additional days, not reporting the claim on day one and allowing the fleet manager to report the accident to Insurer A on day five, would escalate the bill for all elements. If the fleet manager is only furnished with the name and contact details of the third party, plus their car registration number, Insurer A would be floundering, trying to establish the facts. By now, the third party’s insurer, Insurer B, may well have stolen a march and taken control. With Insurer B now in the driving seat, their policyholder’s car is more than likely to have been put in for repair with a garage whose costs cannot be kept in check by Insurer A. The third party is probably also driving a hire car at inflated hire rates, whilst the delay in reporting could unnecessarily extend the duration of car hire. Additionally, the third party may have now instructed their Insurer B’s recommended solicitors to take control of their personal injury claim. All of this will see the total claim cost rising to around £7500, as Insurer A has no control over any costs or procedures to keep their policyholder’s claims ‘hit’ down. This is a bad situation, but it could get worse, if the operator does not have access to something as slick as Gauntlet’s claims process. The operator may well be asked to send or submit a form. Until Insurer A receives it, they will not know which party is at-fault. This means Insurer B is also being hampered by the lack of information and so cannot waive the excess its own policyholder has to pay, if proved to be at-fault. Although they didn’t cause the accident, the innocent third party car driver is forced to pay the excess on their policy, with a view to this then being refunded later, if they are proved blame-free. 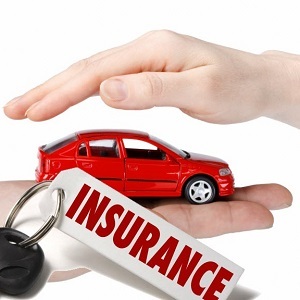 As the majority of policyholders would not pay upfront, the car has to be repaired on credit. From a total claims cost of £1500, when Insurer A was in control, the operator now has a claim on their record of around £2600. Additionally, the third-party policyholder has had to turn to credit hire for a vehicle that will keep them on the road. Thanks to the lengthy delay in reporting the accident, the car hire is likely to go over the 30-day penalty-free limit, incurring high penalty charges. All of this escalates the total claims cost further. If the liability for personal injuries cannot be confirmed within the 15-day period the Ministry of Justice (MoJ) allows, costs will rocket, particularly if a specialist solicitor is brought in to handle the case. Rather than £3000, the personal injury claims costs would now be around £6500 – more than double. But the worst scenario of all is when the innocent third party submits a claim via the Ministry of Justice portal, which could be perhaps as much as 30 days after the accident, if they delay. Insurer A would have to request details of the claim from the third party’s broker. All would be in a state of limbo regarding liability, until the relevant information is acquired. With everything in abeyance, the financial impact is staggering. The third party is likely to instruct a credit repairer to put their vehicle damage right, taking what could have been a cost of just £1500 for repair on day one if in Insurer A’s hands, to over £4000. Hire charges could be levied at commercial rates, if the claim drags on for over 90 days, escalating what could have been a charge of £500 to over £7500. If no agreement on the liability for the personal injury is reached within 90 days, a claim could be prepared for Court, with all the legal expenses this entails. The £3000 personal injury pay out that could have been possible on day one, could end up being something like £8500. Gauntlet’s managing director, Roger Gaunt, says: “Some fleet managers think the right thing to do is to bide their time, assimilate facts and then pass on details to their insurer or broker, whilst others believe it best to hand all claims details over to their broker at the end of a month, or to allow the third party to put their claim in and do nothing from their side. All of these things are absolutely the wrong thing to do, if a fleet operator wants to keep their premiums as low as possible. “By not acting immediately, an operator could quadruple the size of the claim on their record and give their insurer every reason to look very unfavourably on them at renewal time. If they dilly-dally with every claim their fleet incurs, they could be racking up unnecessary costs that are four, five or even six-figure numbers.